Will this Online Casino make your wishes come true? They claim they can, but can they live up to their promise? Wishmaker opened their doors in late 2018, and has already shown itself as a brand which will stick around. We took the new Casino on the block for a spin and here’s the experience we had. The first reason why you should sign up at Wishmaker and give it a spin should be their Double-Double, meaning you get a 100% bonus on your first two deposits. First one up to €50 and second one up to €150. You really don’t want to miss out on this offer! Their ‘Getting Started’-guide really helps out new players get a great first impression. 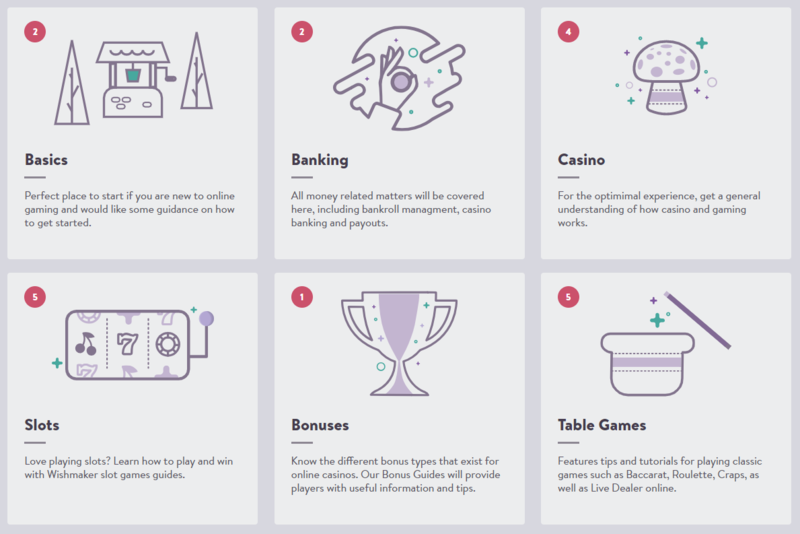 Six different sections helps teach the player everything they need to know about Wishmaker and it’s Basics, Banking, Casino, Slots, Table games and Bonuses. Trophies, trophies and trophies. 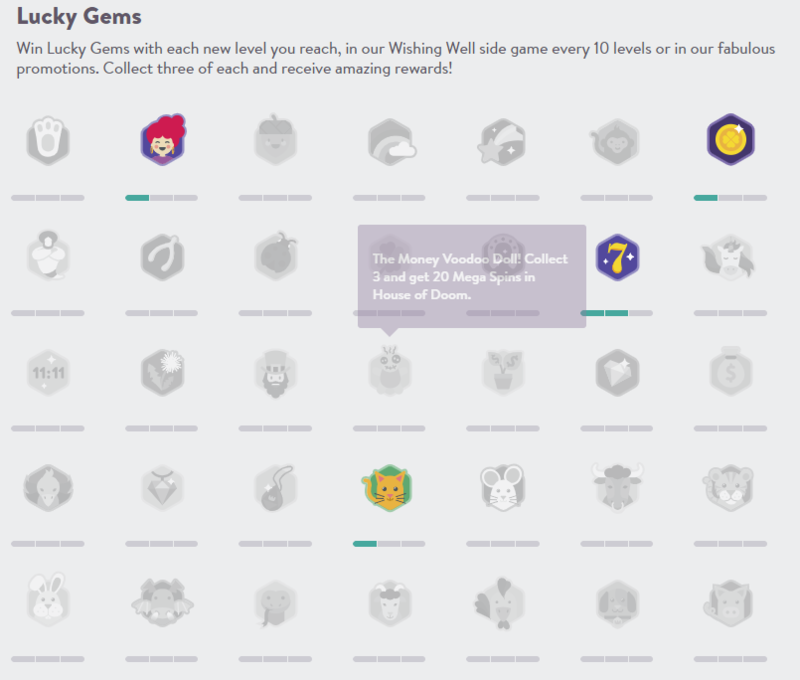 As you play, you can collect Activity Trophies, Rank Trophies and Game Lover trophies. Rank trophies are handed out as you level up, whilst the other trophies are based on log in, depositing, playing certain games or winning big. Wishmaker offers to double your first two deposits, the first one up to €50 and the second up to €150 for a maximum total of €200. Together with your first deposit, you are also given 200 free spins on the PlaynGo game Reactoonz. The free spins are paid out 10 on the day of your first deposit, and then 10 per day for the next 19 days. When it comes to the terms and conditions of the welcome bonus, they are more generous than other casinos, with a wagering requirement lower than most. Here are the key points of the bonus. A bunch of excluded games from bonus use, check up on the list so that you are not surprised. A Double-Double are rare and far apart. Make sure you don’t miss out on this great offer. Slots is life and life is slots. 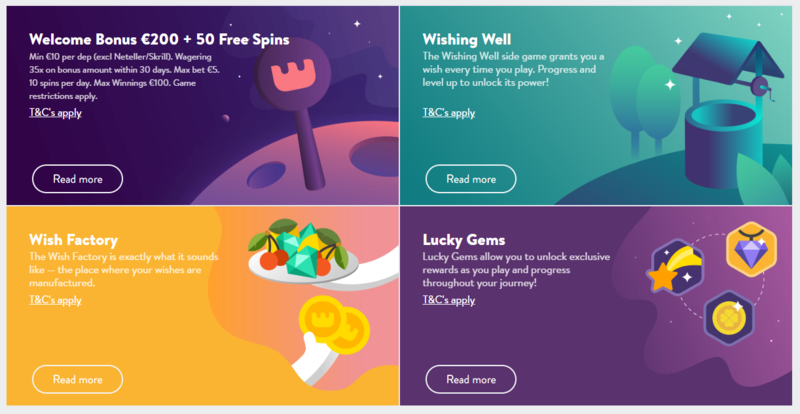 At Wishmaker, they proudly boast 1144 games (at the time of this review) and have tons of different Game Studios available, such as Netent, PlaynGo, Betsoft, Scientific Games and many more. Their filtering system is one of the better and easier to use systems we have reviewed lately. Outside of the normal search functionality, they allow you to filter the games based on Categories, Game Studios, Features, and Themes. 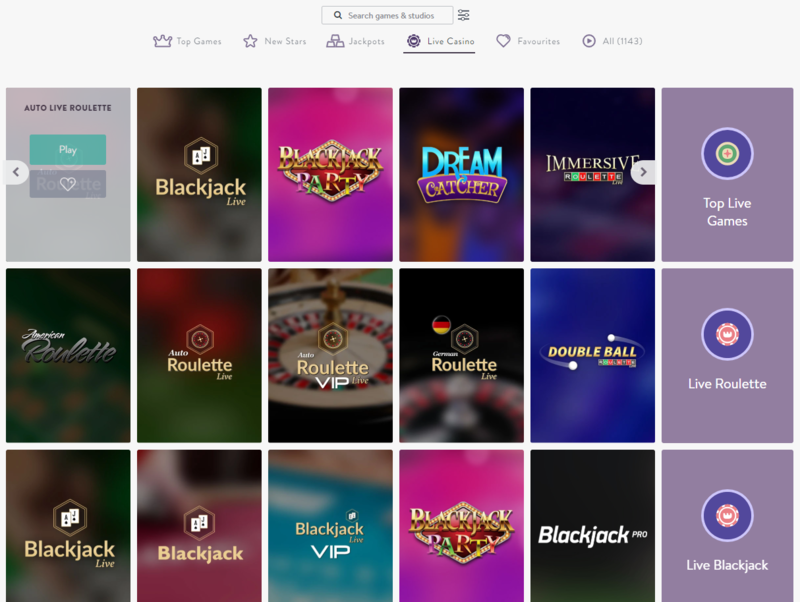 You can mix and match as you want, so you can for example filter for ‘All Branded Slots from Netent, Microgaming or Scientific games who have Sticky Wilds or Expanding Wilds as feature and get six games which fulfill the criteria. We gave the new MEGAWAYS slot Buffalo Rising a shot and we were not disappointed. 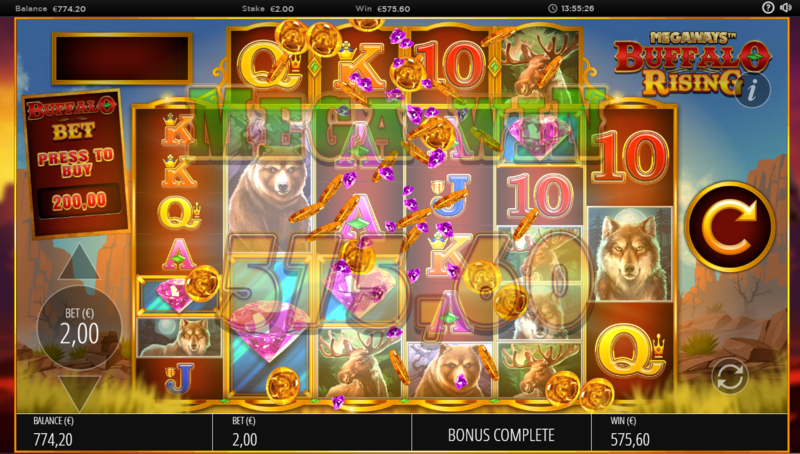 On a €2 bet, we managed to get a megawin of €575,60 in the Free Spins round which . Hopefully we will manage to wager the bonus and cash out! 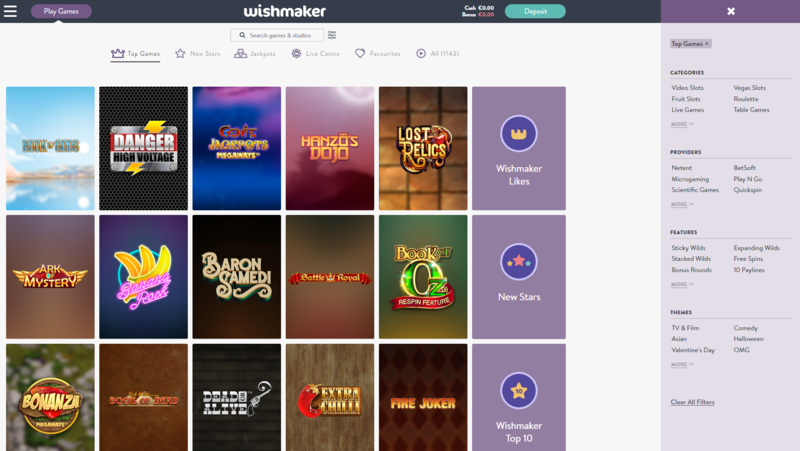 When it comes to the Live Casino, Wishmaker offers games from both Evolution Gaming and Netent Live. As we review a lot of Casinos, being original when writing about the experience is not always easy. When we come upon a Casino very similar to many other, we choose a game we haven’t tried before or not played for a while at least. This time, we headed for Blackjack Party, because we did this review on a Friday afternoon. 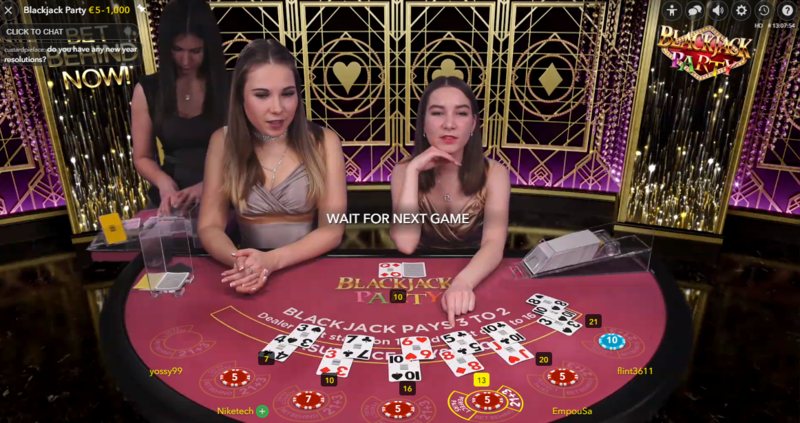 In Blackjack Party, you play a normal game of baccarat, but instead of one dealer, there are two and a third dealer shuffling to speed up the game. The two dealers at the table will talk about anything high and low. Last time we tried the game, the Dealers were outgoing, British English speaking and were quite fun to engage with when playing the game. It can be a bit mixed at times of course with Live casino, some of the hosts are amazing some less so. There are plenty of tables to choose from if you don’t really bond with the dealer. Food for thought for the next Wishing Well set up. We should add though that the prizes in the Wishing Well change and get better as you level up and earn a higher VIP level. 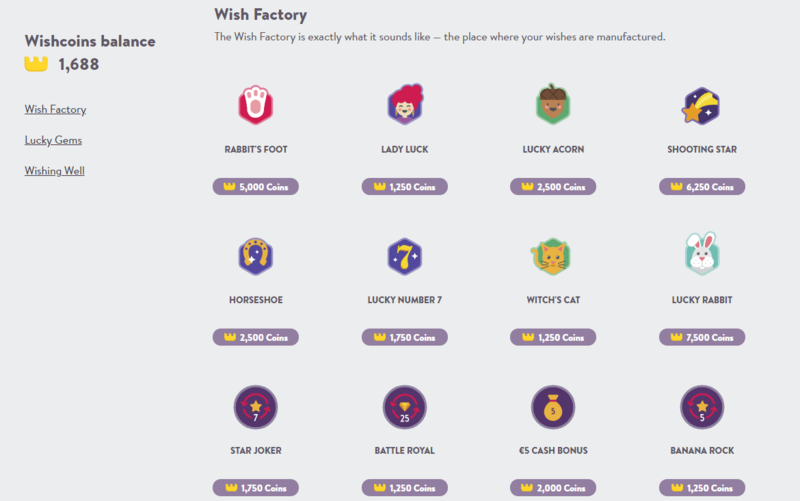 Then there is also Lucky Gems and the Wish Factory. You can earn Lucky gems as you level up, and once you have collected three of them, you can exchange them for the prize. Prizes range from free spins, to bonuses and Cash. We give Wishmaker a solid 5 out of 5 stars. (upgraded from 4.5 after many many hours of play and deposits/withdrawals). A very clean and fun gaming experience.